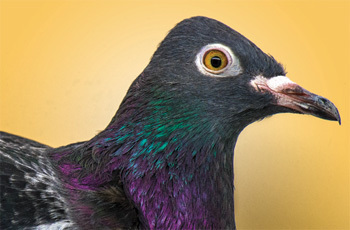 Pigeons are providing key insights into how genes change over time. Researchers led by biology Assistant Professor John Fondon are unraveling the molecular basis for the color palette of domestic breeds known as “fancy pigeons.” The team has identified mutations in six genes that interact to create color variations. Dr. Fondon and his student colleagues also discovered that some color varieties arose independently multiple times through recurrent mutations of the same genes. The genes in the study have been linked to skin and hair color variation in humans, as well as the development of melanoma.